Another team of three will head up to Ruakaka this weekend and make the most of the good surface and the Northland based track provides on regular occasions throughout the winter. Talented galloper, The Last Shower (pictured), is one who will most certainly appreciate the better conditions as she is likely to run in the Open Handicap Event over 1600m, following a nice run on the same course at her last outing. “It was muddling run at her last outing and we are expecting her to be very hard to beat tomorrow,” co-trainer Chad Ormsby said. The Last Shower will be ridden by Trudy Thornton and will be chasing her fifth career victory. An interesting runner on the card will be the young juvenile Majic El who will make his debut appearance in the Open 2YO event over 1000m with Thornton also to take the reins on the younger stable mate. “Ruakaka was the best option for him as we think he needs a good track, and while we don’t know what to expect, he has shown us good ability at home.” Ormsby said. The third and final runner on the card will be the striking grey filly Flavigny who has come on in leaps and bounds following her fresh up effort a fortnight ago. 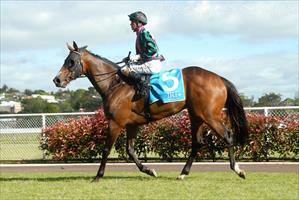 “She had not raced in months, so to run fourth was a very good effort, and she has only improved since,” Ormsby said. Flavigny will be racing in the Rating 65 event over 1200m and jockey Trudy Thornton will also be riding the daughter of Mastercraftsman.